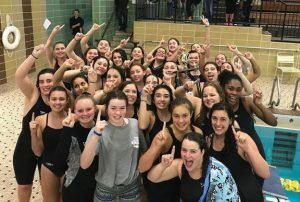 WATERBURY — Woodland swimmer Dia Gawronski said she told her teammates they would make history last Friday. And she made sure of it. Gawronski and her teammates put forth an epic effort and outperformed the competition as the squad earned Woodland’s first NVL swimming and diving title. The Hawks defeated previously unbeaten Seymour, and the rest of the league, last Friday at Kennedy High School. The Hawks put 791 points on the board to outscore runner-up Seymour, which finished with 780 points. One of Woodland’s senior captains, Gawronski broke nine records at the meet. Her win in the 100 butterfly in 57.21 seconds broke the Woodland school record, the Kennedy pool record, the NVL record and the NVL championship meet record. In the 500 free, Gawronski won the event in 5:10.58, and set the Woodland school record, the Kennedy pool record and the NVL championship record. Brooke Pope, also a team captain, won the 100 yard free in 56.33. Perhaps it was the first event of the night that set the tone. Woodland took second in the 200 yard medley relay and set a school record with the team’s four captains — Gawronski, Pope, Kyla Drewry and Jordan Williams. “Our four captains have just been amazing, in the pool and outside of it,” Woodland head coach Mike Magas said. In the 200 IM, sophomore Morgan Swift went on to earn a fourth-place finish after being seeded 12th prior to trials. In the 200 free, sophomore Casey Brooks placed fifth, while freshmen Emily Beyer (eighth) and Spenser Burkowsky (15th) posted personal best times. Woodland also received a lift from its divers who had three place among the top nine. Maddie Hoxie took sixth overall, while Julianna Bartolucci was eighth and Adrianna Byczko was ninth. Make no mistake, the team understands and appreciates what it accomplished last Friday. The Hawks will now head to the Class S meet Nov. 14 at Southern Connecticut State University. The diving competition of the meet was set for Thursday.